For some winter evening pictures, I chose a black snowflake background from a stack by D.C.W.V. I matted the pictures with blank white postcards which are just the right size to leave a nice thin border around a 4x6 picture. I had epoxy stickers from Oriental Trading Company but I wanted them black on the white cardstock journaling block so I stuck them to black paper first and then trimmed around them and attached them to the journaling block with adhesive. I added a couple clear-backed word stickers directly to two of the pictures and it was all done! 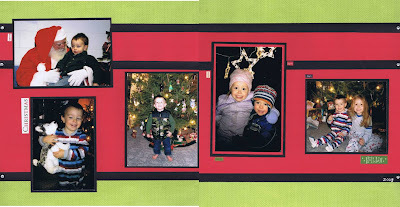 Like Scott and Bekah's 2008 Halloween pages, their Christmas pages are another example of how I used the same layout for each of them and just customized the pictures used to make a two-page spread for each of their albums. 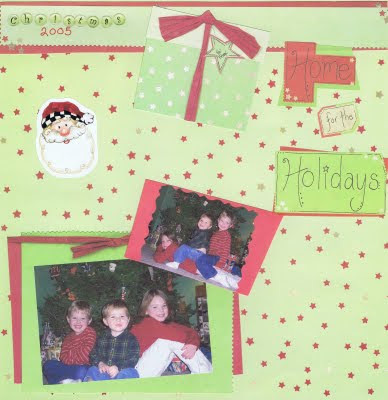 My green background papers came from a Christmas stack by D.C.W.V. 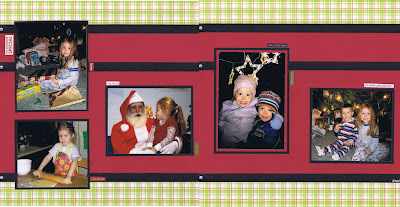 (those big 12x12 stacks are great deals when you can get them on sale or with a 40% off coupon from JoAnn Fabrics - I use mine for everything...not just Christmas pages). I used red and black cardstock to create the rest of the background. 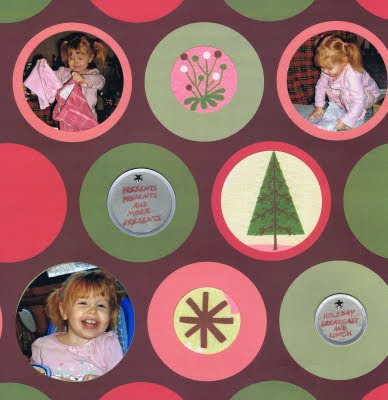 The only other accents on the pages are silver eyelets and tiny Christmas word stickers from a pack by Memory Makers. 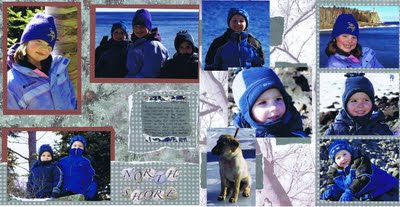 This is one of my earlier pages and it was made from a kit from Oriental Trading. I don't particularly like some of the first pages that I scrapped, but it is fun to look back and see how far you have come and how much your style has changed. 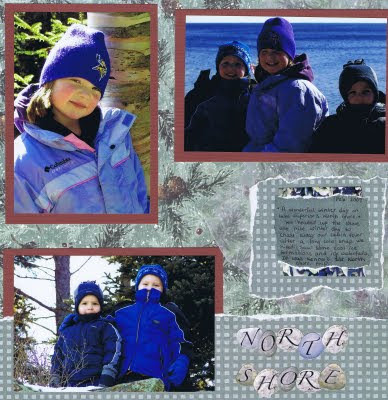 Page kits are a great way to go if you have trouble coordinating papers and embellishments, or if you don't have much time. Everything is right there ready for you to just add your photos. As much as I'd love to post nothing but Christmas pages ('tis the season you know), I suppose that might get old so I'll throw an everday page in the mix. 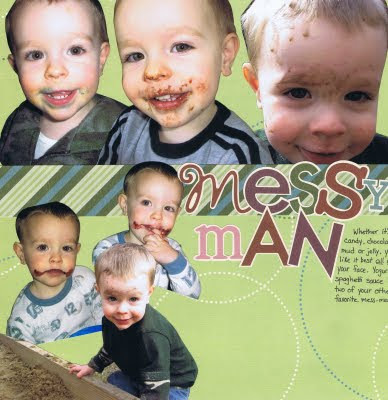 Here's a single 12x12 page I did of my son's various dirty face pictures. 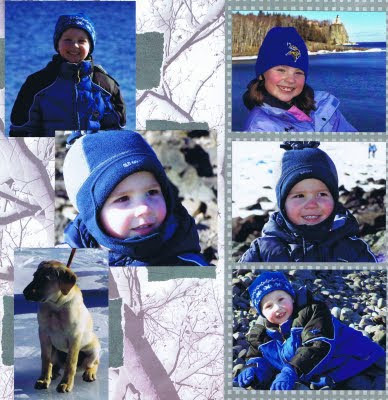 I had a lot to fit on one page so I silhouetted each picture and overlapped them on a collage-style layout. 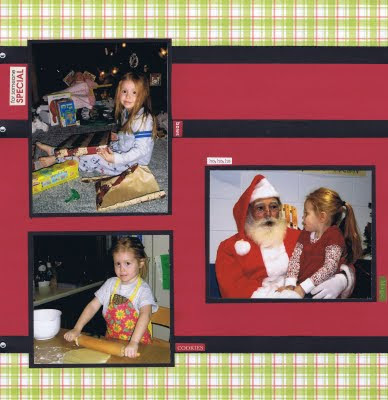 The background paper, coordinated strip of paper and punch-out letters all came from a coordinated stack by Colorbok. I hand-wrote my journaling directly onto the background paper. 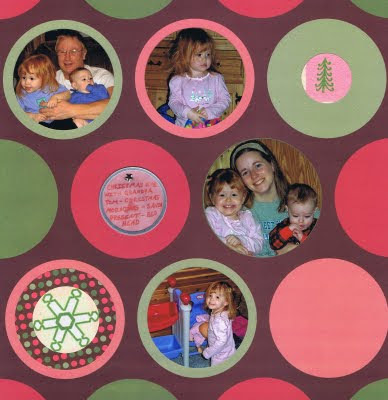 I probably beat circles to death on this three-page set of Bekah's 2006 Christmas. The background paper is from a 12x12 Christmas stack by D.C.W.V. I followed the pattern of the background by cropping my pictures into circles. I cropped graphics from other paper from the same stack into circles to use as perfectly-coordinated accents on the page. 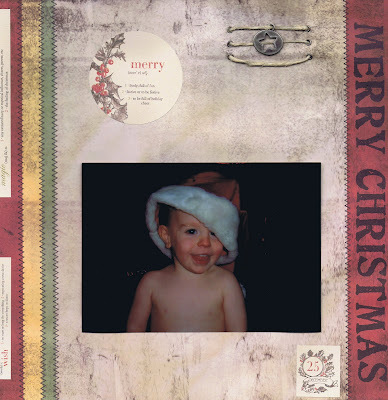 My journaling was written on circular velum tags and attached with small star brads. 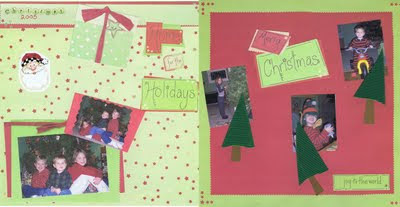 The candy cane paper I used on this page came from a D.C.W.V. Christmas stack. 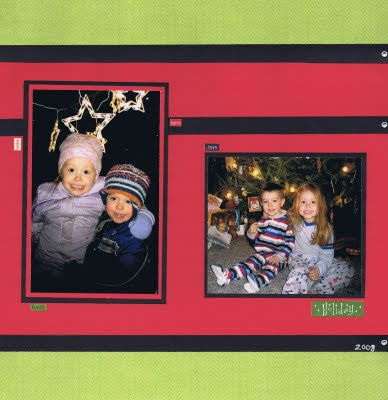 I layered white and green cardstock to make the title and the photo area. I used metal letters for the title. 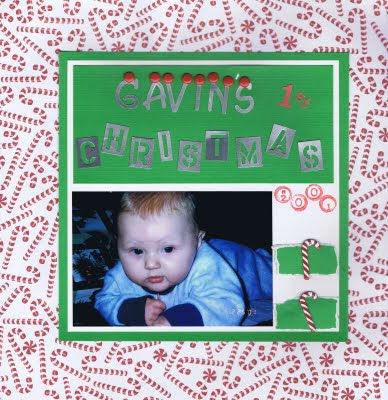 The letters used to spell Gavin are attached to the page with eyelets. To attach the letters used to spell Christmas I used an adhesive runner and then "folded" the adhesive with my fingers so that there wasn't any sticking over the edge. 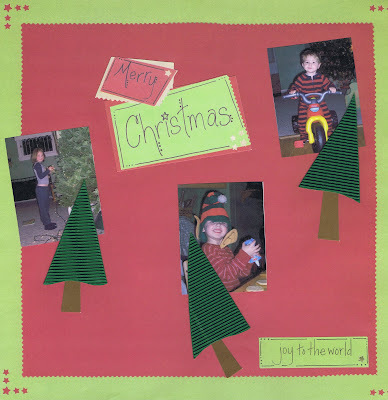 I used cardstock stickers for the 1st and stamped on the year. The candy cane accents are brads that I ordered from Oriental Trading. I placed them on more green cardstock that I tore the edges of. 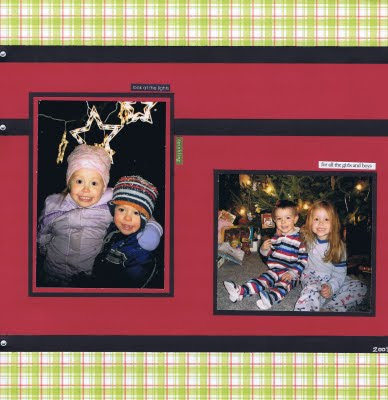 Here's a super-easy Christmas layout to make up for it. I started with a 12x12 sheet from a Christmas paper stack by D.C.W.V. 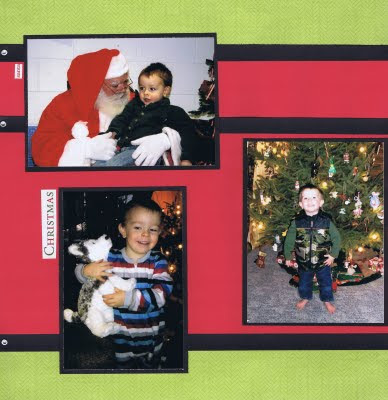 and mounted a single shot of my son in a santa hat with foam adhesive to make it pop off the page (can't really tell that in the picture below). I added some vintage-style stickers. For a 3-D accent, I threaded twine through six metal eyelets and strung on a star charm.